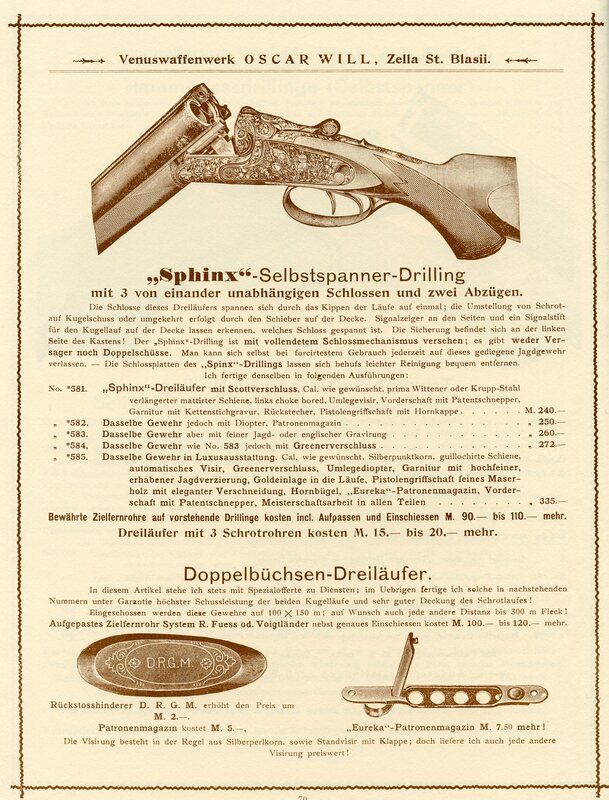 The major source for the following biographical information is the Directory of Makers & Tradesmen compiled by Mr. Jesse Thompson and is found in Alt Scheibenwaffen, Vol. 2 by Rowe, Thompson, Dillon, Hallock and Loos. It is used here through the courtesy of Mr. Tom Rowe. 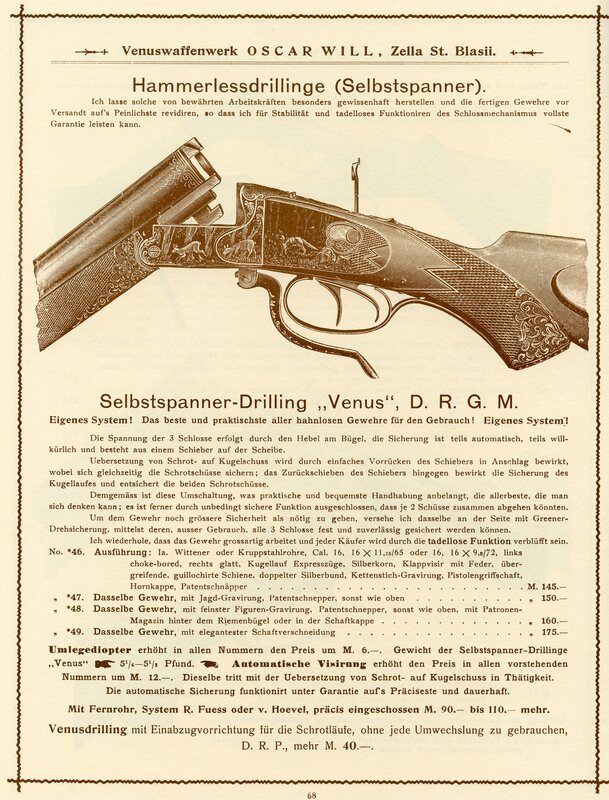 In 1844 Ernst Leo Will set up a gunmaking shop in Zella St. Blasii which would eventually become the Venus Waffenwerk. 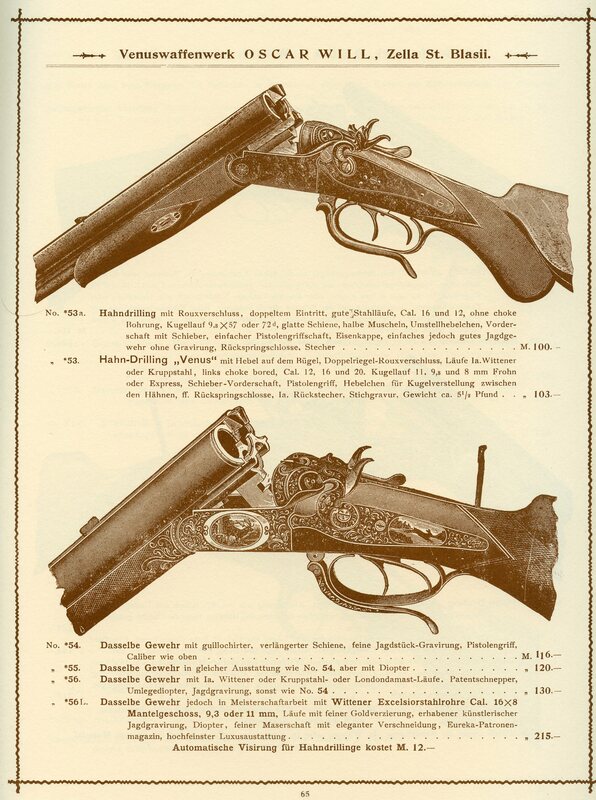 The gunmaking families of Zella St. Blasii, Mehlis and Suhl were often inter related through marriage. 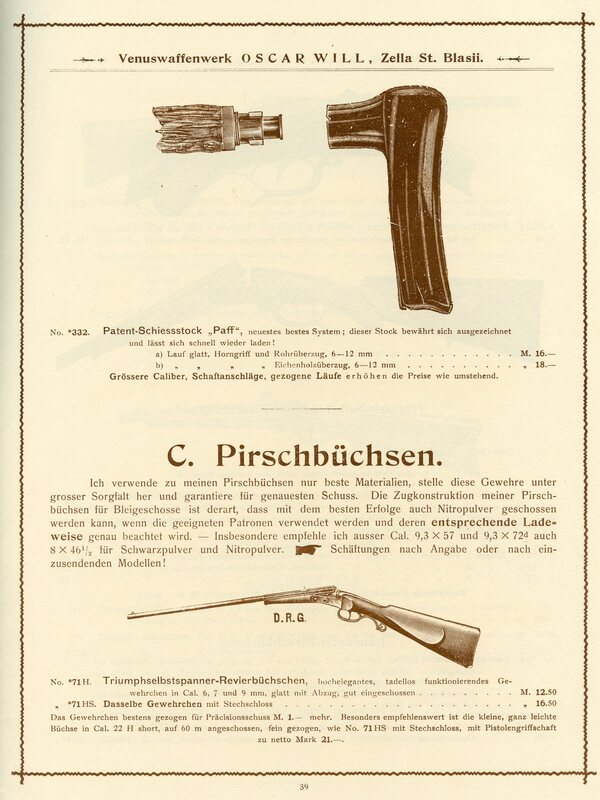 In an article titled An Experimental 7.65mm Walther Pistol by Ed Buffaloe it is reported that Ernst married Charlotte Walther who was possibly a sister to Carl Walther. Later their son Oscar would marry Helene Langenhahn the daughter of Valentin Friedrich Langenhan. The early years for Ernst Leo and Charlotte were meager ones. In his later years Oscar would tell the story that he and his father would go out into the woods barefoot to collect fallen branches for fuel. 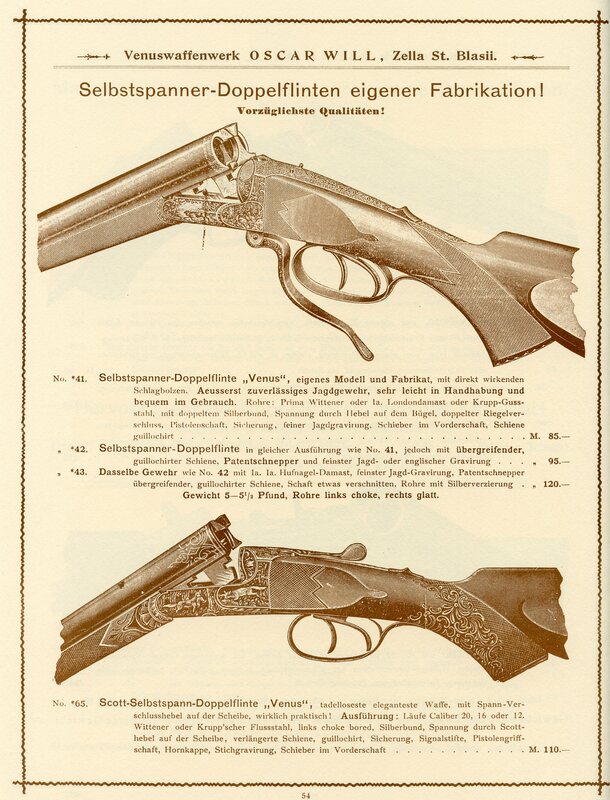 Günter Oscar Will (May 19, 1859- 1926) learned the gun trade and had a good sense of business which led to the success of his establishment- the Venuswaffenwerk. A letterhead from 1906 shows the wide variety of Arms made by this firm. 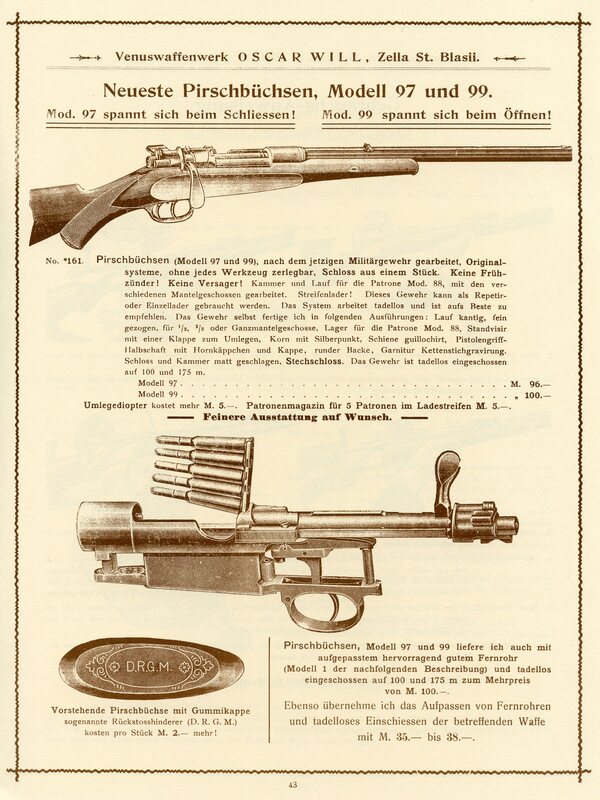 They included Teschins (small caliber inexpensive single shots), Luftgewehre (airguns), Kurzwaffen ( handguns), Zimmerstutzen (small caliber low power target rifles), Scheibenbüchsen ( Single shot target rifles), Pirschbüchsen ( single shot and bolt action Stalking rifles), Doppleflinten (side by side double barrel shotguns), Büchsflinten (over and under double barrel shotguns) and Drillings (a three barrel combination gun). By the age of 40 Oscar was successful and as a sporting arms maker and retailer also enjoyed taking part in shooting events. He was successful in both hunting and in target shooting, often bringing home trophies of one kind or another. World War I brought sadness to his family. His two oldest sons were both killed in the early days of that War. On June 10, 1920 at the age of 61 Oscar sold the business at Kleine Bahnhofstrasse 17 to Dipl. Ing. Wilhelm Foss. Mr. Foss ran the business until 1945 when like so many others it was closed by the Government. 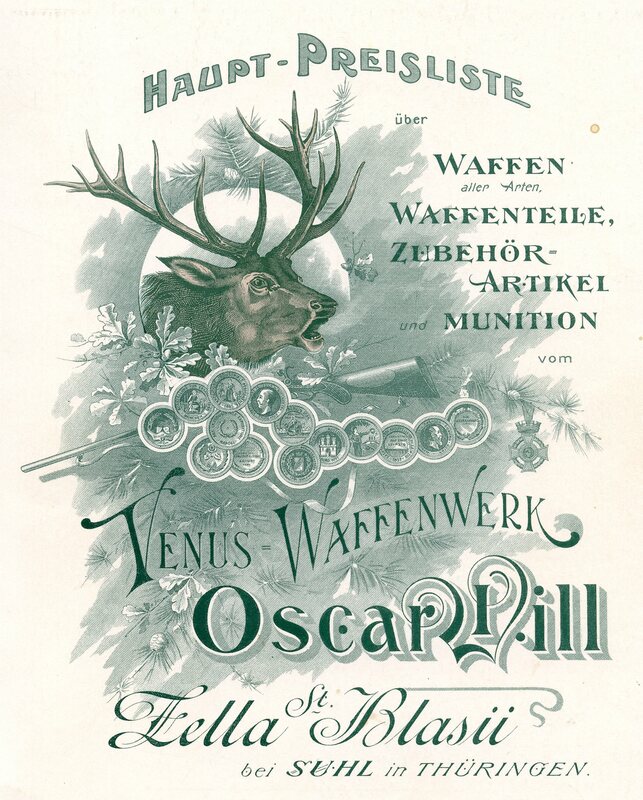 During Oscar Wills ownership of the Company his name was prominant with the title “Venus Waffenwerk” being secondary. 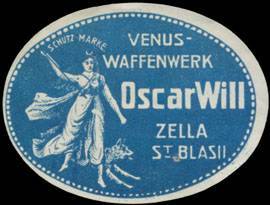 After 1920 the “Oscar Will” name became secondary to the name “Venus Waffenwerk”. While the Company survived the 1920’s and 1930’s it was not as successful as it had been before the war. After retiring and selling the firm Oscar moved to the area between Fulda and Giessen in what became West Germany after 1945 to live out the last 6 years of his life. The following is a letter written by Paul Weiss to Jesse Thompson on March 16, 1972 and is copied here in full as it is found in the Alt Schiebenwaffen Vol. 2. 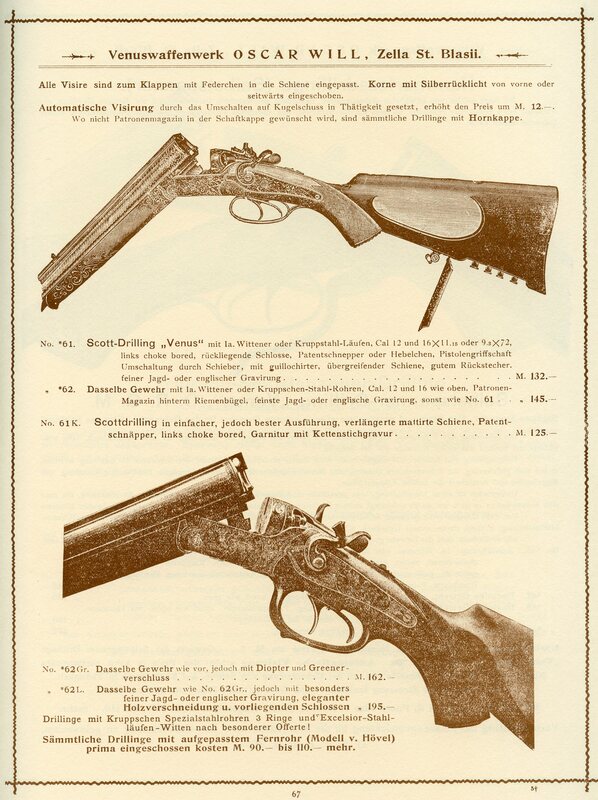 The following catalog pages state that the single trigger they used had a DRP patent protection. 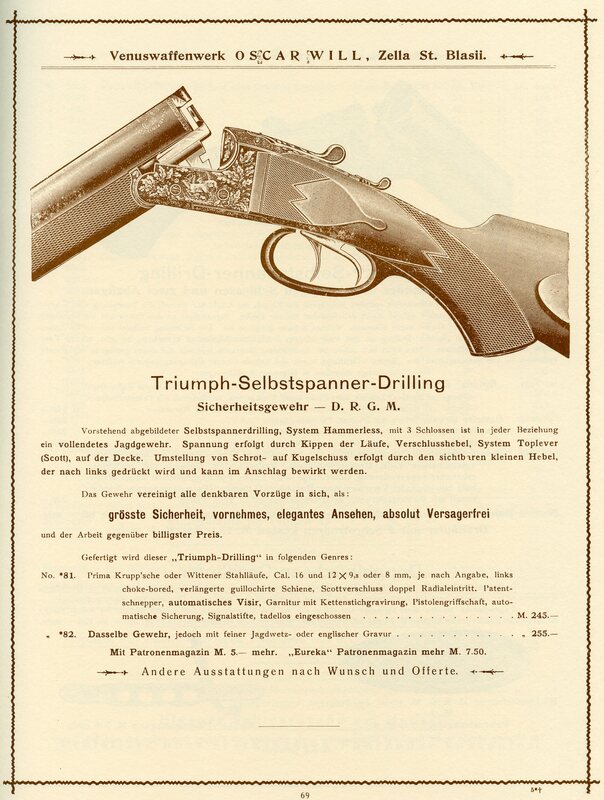 The catalog also mentions that the Triumph self cocking Pirschbüchse, and the Venus and Triumph self cocking Drillings were covered by D.R. G. M.’s. D.R.G.M.’s that are known to have been issued to Venuswaffenwerk- Oscar Will are no. 207317 of 10/8/03 and 5360040 of 28/12/12. The second is for a target pistol with a Martini action. 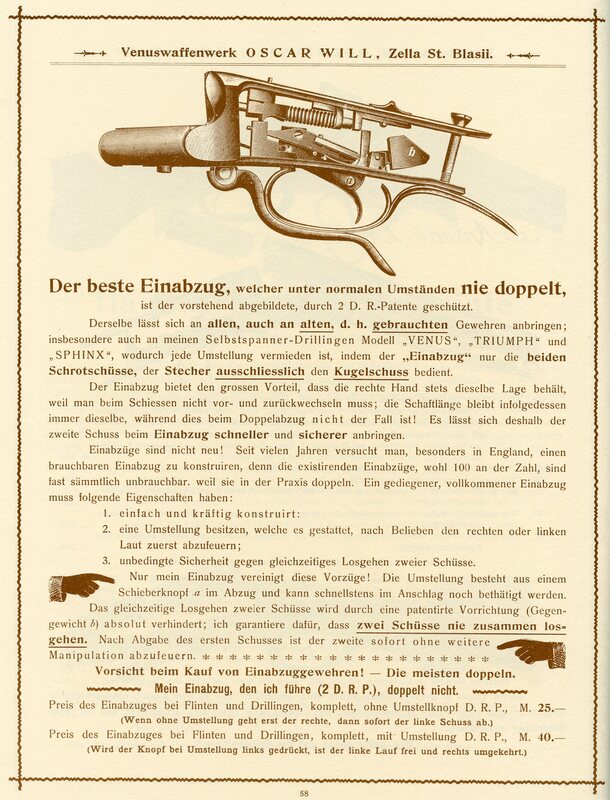 I could not find any German patents (D.R.P.) 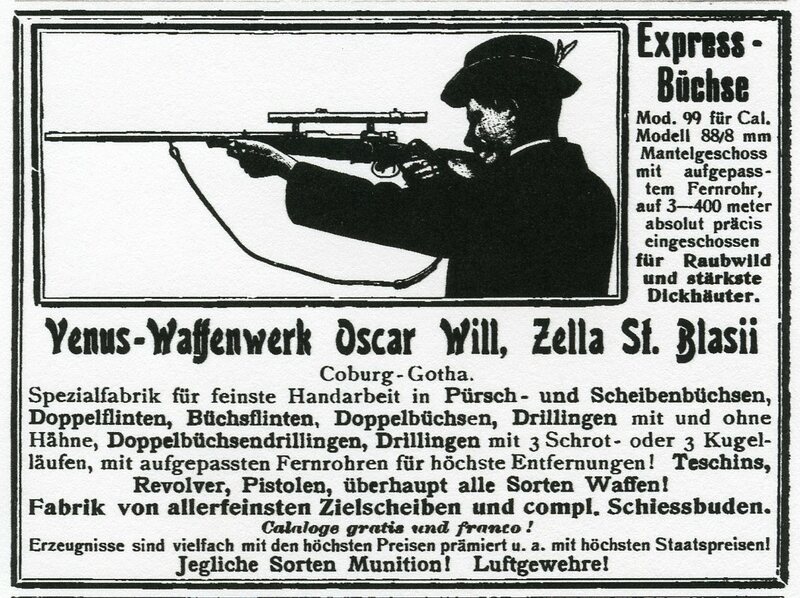 issued to Oscar Will or the Venus Waffenwerk. 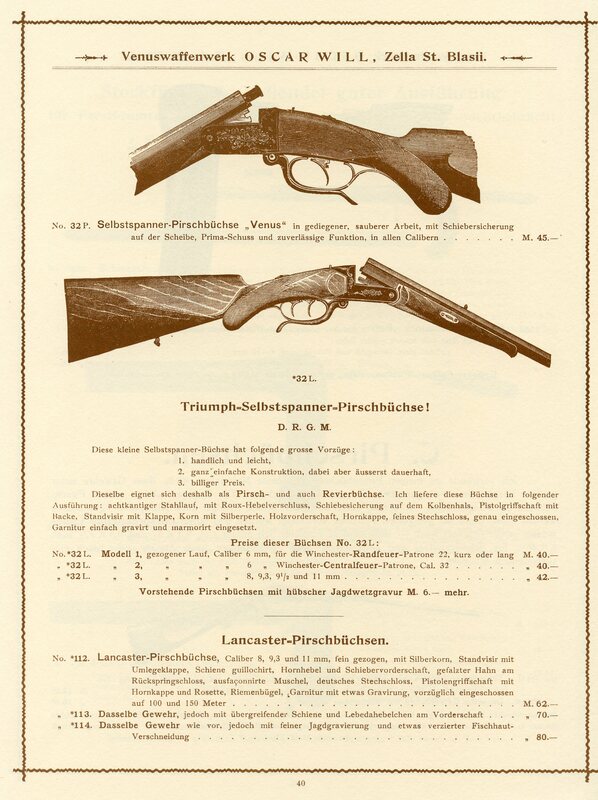 Oscar received two British patents for improvements to their air rifles. 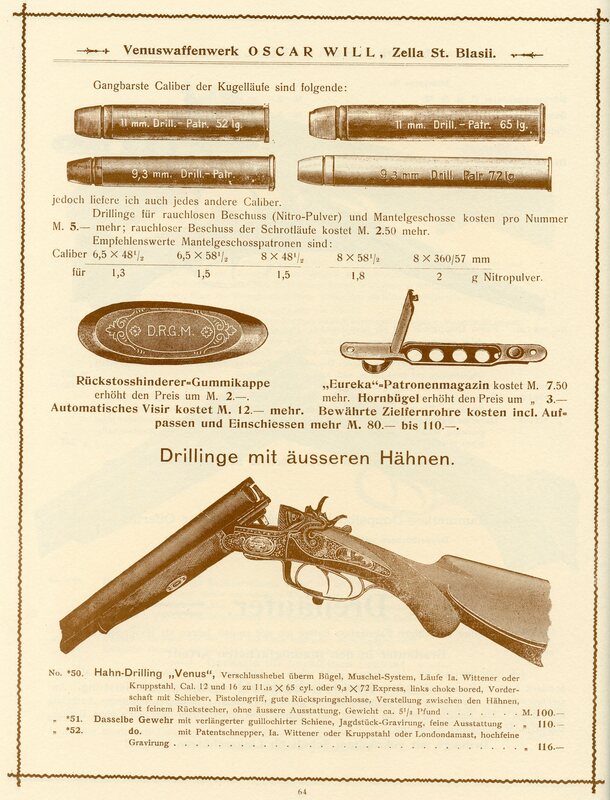 They are 22,202 of 1905 for a locking device for Air Guns and 12,763 of 1896 for an Improvement in Air Guns. The Venuswaffenwerk arms used trade names which included Triumph, Venus and Sphinx. 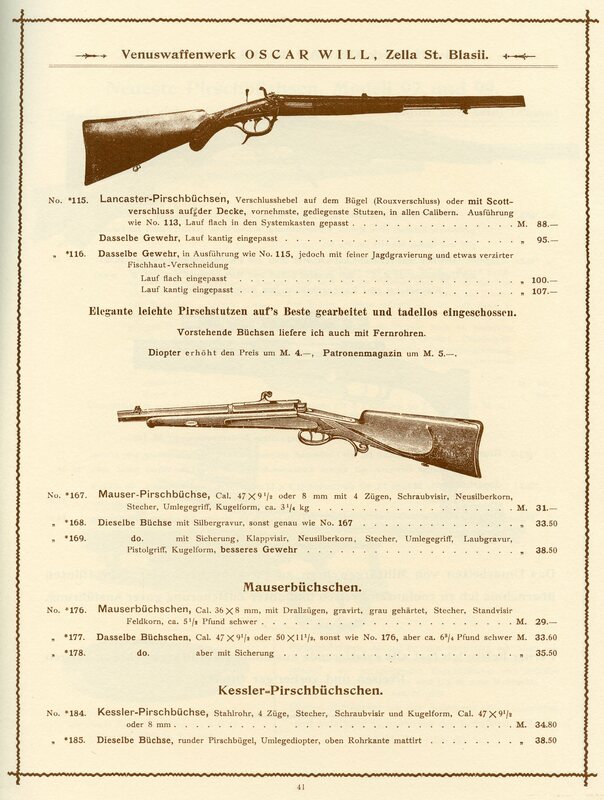 The following selected pages are from a 1902-03 Catalog. 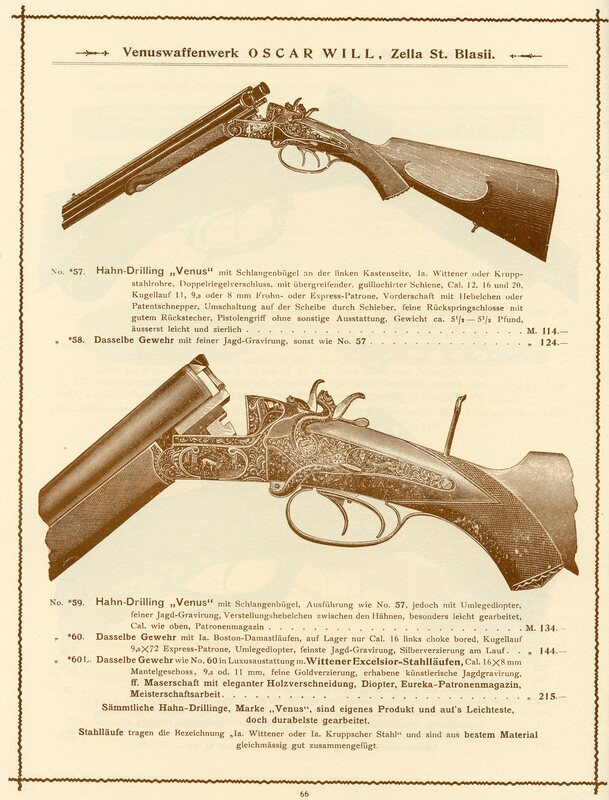 Another Zella- St. Blasii gunmaker was Julius Wilhelm Will a Meister (Master) gunmaker who also set up shop in 1844. The relationship if any between Julius and Ernst is unknown. Evidently Julius was still active in the business as late as 1886. Locations were on Kirchstrasse in 1925, Hauptstrasse 101 in 1929 and Adolf-Hitler Strasse 101 in 1936. 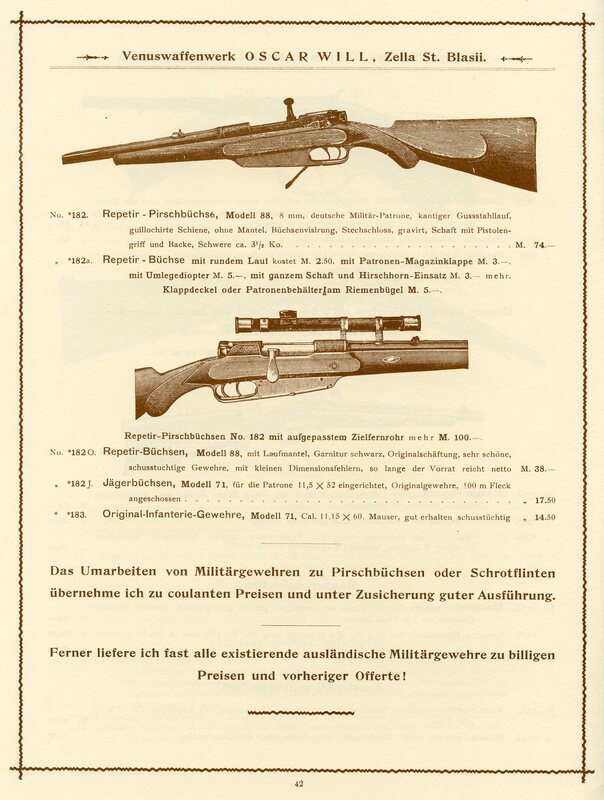 While the firm sold waffen made by other firms they specialized in the manufacture of Air Guns.